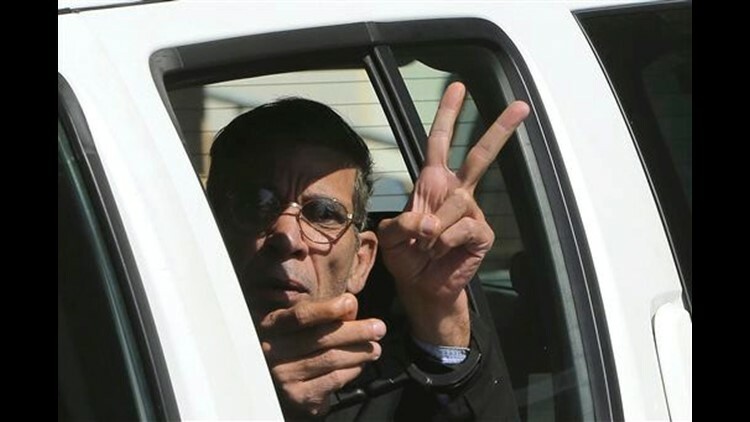 LARNACA, Cyprus (AP) — A Cypriot court on Wednesday ordered an Egyptian man to be detained for eight days after authorities said he admitted hijacking a domestic EgyptAir flight and diverting it to the Mediterranean island by threatening to blow it up with a fake explosives belt. Cyprus police prosecutor Andreas Lambrianou said the suspect, whom authorities had identified as 59-year-old Seif Eddin Mustafa, faces preliminary charges including hijacking, illegal possession of explosives, kidnapping and threats to commit violence. The allegation regarding explosives could be dropped if the liquid found with Mustafa is not explosive material. Egypt's General Prosecutor Nabil Sadek, meanwhile, has officially asked Cyprus to extradite Mustafa in order to start an investigation, his office said. Tuesday's hijacking, which started when authorities said Mustafa claimed to have explosives and forced a flight from Alexandria to Cairo to land in Cyprus, ended peacefully about six hours later. Most of the 72 passengers and crew aboard the Airbus A320 were released soon after the plane landed, although a handful were held for longer. All were let go before Mustafa surrendered. Lambrianou said after Mustafa was arrested, he told police: "What's someone supposed to do when he hasn't seen his wife and children in 24 years and the Egyptian government won't let him?" Egypt's interior ministry said Mustafa had a long criminal record but had finished serving a one-year prison term in March 2015. An official at the general prosecutor's office in Egypt, speaking on condition of anonymity because he was not authorized to speak to the press, said there was no travel ban on him. Lambrianou said 15 minutes into flight MS181 Mustafa demanded that the aircraft be diverted to an airport in Greece, Turkey or Cyprus. Despite an initial refusal from Cypriot authorities, the plane eventually landed in Larnaca after the pilots warned of low fuel. The police prosecutor said witnesses saw Mustafa wearing a white belt with pockets that had cylindrical objects stuffed inside. Wire protruding from the cylinders led to what appeared to be a detonator in his hand. Innes told The Sun newspaper he wanted to take "the selfie of a lifetime" while the incident was unfolding. The bizarre photo, taken by a member of the cabin crew and shared on social media, shows him posing smiling next to Mustafa, who has his jacket open to reveal the fake explosive belt. Lambrianou said no explosives were found in the belt, except for a container filled with an unidentified liquid. Police also found an unidentified liquid in the suspect's bag, as well as numerous documents in Arabic. The prosecutor said Cypriot authorities will ask for help from Interpol to determine how the suspect managed to get the fake belt through airport security in Egypt.